In this classic satiric novel, published in 1889, Hank Morgan, a supervisor in a Connecticut gun factory, falls unconscious after being whacked on the head. When he wakes up he finds himself in Britain in 528--where he is immediately captured, hauled back to Camelot to be exhibited before the knights of King Arthur's Round Table, and sentenced to death. Things are not looking good. But Hank is a quick-witted and enterprising fellow, and in the process of saving his life he turns himself into a celebrity of the highest magnitude. 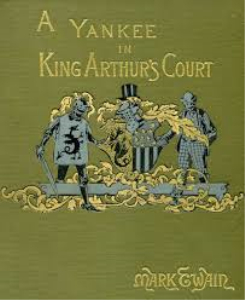 His Yankee ingenuity and knowledge of the world beyind the Dark Ages are regarded as the most powerful sorcery--winning him the position of prime minister as well as the eternal enmity of a jealous Merlin. In an effort to bring democratic principles and mechanical knowledge to the kingdom, Hank introduces newspapers, telephones, bicycles, and other modern conveniences to the Britain of the Dark Ages. But when he tries to improve the lot of the common people, chaos and war result, giving a bittersweet to end to this comic masterpiece by one of America's greatest storytellers. Unabridged.